– Wedding music: We love our work! This is most important day of your life, you’re dreaming of how it could be in Italy, with a beautiful Tuscany landscape in the background….so ladies and gentleman introducing: Siena!!! The town known all over the world for its incredible historical and artistic heritage, for its landscapes and the famous Palio race, that takes place every year in the famous Piazza del Campo. You can choose the city of Siena and his famous art, monuments and typical views, or one of the many beautiful towns around such as Montalcino, San Gimignano, Pienza, Montepulciano, San Quirico d’Orcia an so on…or you could prefer one of the Historical Villas, Residences, Relais, Country houses, Farm stays, Hotels to live a special time in absolute quietness and relax. You’re now making your dreams come true!! !You want enjoy this special moment with family and friends and you know how much Music is important to make your wedding memorable, romantic and…funny!!!! You can trust on us!!! Couples of all nationalities have come to depend on us for our musical talent as well as for our professionalism and reliability. During the last years we’ve played in quite all the wedding locations in and around Siena, to name just a few of them: Villa Catignano, Borgo Casabianca, Castello di Velona, Terre di Nano, Casa Cornacchi, Villa Podernovo, Villa Vistarenni, Borgo di Castelvecchio, Tenuta di Papena, Villa Le Bolli, Borgo Stomennano, Locanda in Tuscany, Castello di Meleto, Castello di Modanella, Torre alle Tolfe, Castello La Leccia, Casale del Marchese, Capannelle Wine Resort, Podere Val D’Orcia, Castello Banfi, Villa Dievole, Villa Ducci, La Lucciolaia, Le Torri di Porsenna, Agriturismo Podere Casato, Agriturismo San Galgano, Antico Borgo San Lorenzo, Borgo San Luigi, Borgo Vignale, Chiostro del Carmine, Fattoria San Donato, Borgo San Felice, Canonica di Cortine, Pozze di Lecchi, Locanda dell’Amorosa, Locanda Vesuna, Palazzo Massaini, Chiostro di Pienza, Palazzo del Capitano, Tenuta di Corsignano, Lazy Olive, Villa Bordoni, Villa Buoninsegna, Villa Cicolina, Villa Pietra Antica…. Our Wedding band Siena Italy knows how to throw a wedding party!!! We set the stage for a great entertaining, relaxing and fun filled experience for everyone of all ages. 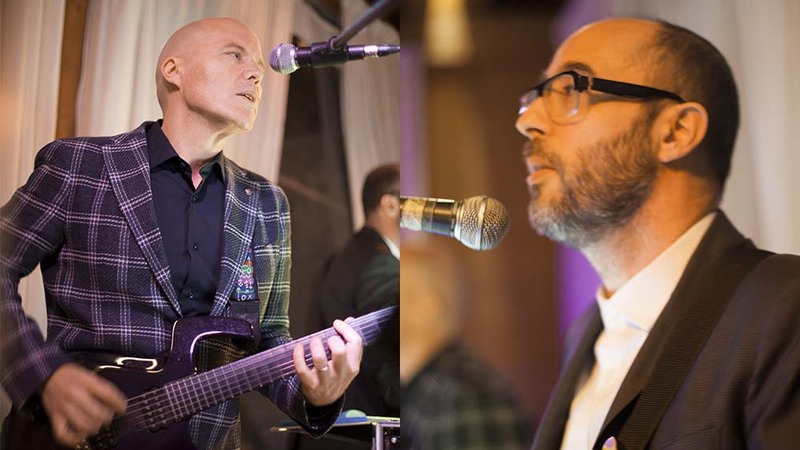 So whether it’s Top 40 Dance, Disco, Oldies, Rock, Pop, R&B or a great dance mix of everything in between – Our Siena Wedding Band does it all with considerations keeping you and your guests in mind. And when you put it all together, you will have a memorable event that everyone will talk about for years to come. 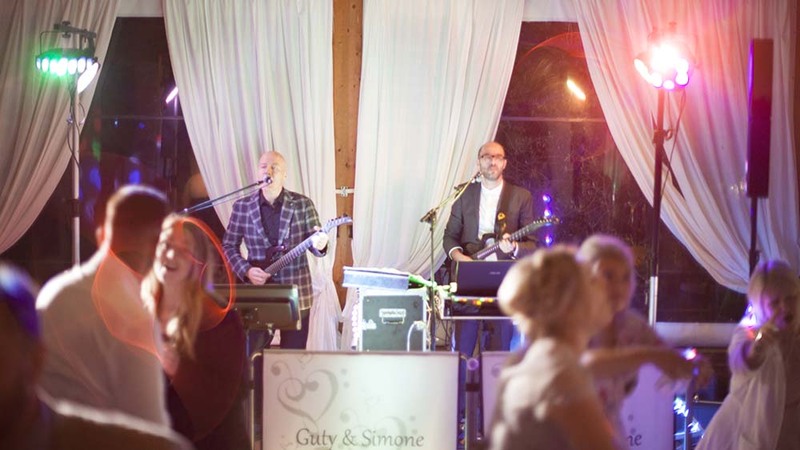 Our Wedding band Siena Italy is not only a music band, it is a full sound and lights design for events. Guty & Simone the Siena Wedding Band have a wide repertoire including all musical genres from the 50’s to present day: Italian and International Pop, 70’s-80’s Disco, Latin, Rhythm and Blues, Ratpack/Swing, Rock, Reggae, Country and Folk etc..
Our Wedding band Siena Italy can also accept DJ requests on-the-fly since we can access the web through our own Internet connection!!! In addition to the standard package our Wedding band Siena Italy can also organize the entire music entertainment for your BIG DAY!!! – Wedding band Siena Italy will help you also to pay ONLINE the SIAE music tax fast & easy from your home, wherever you are!! If you’re looking for something special for your Wedding our Wedding band Siena Italy can help you! !